Elie Radu was a distinguished Romanian artisan and civil engineer. The network was not built in the same style as other Eastern European systems. Firstly, the design of the stations on the initial lines was simple, clean-cut modern, without excessive additions such as mosaics, awkward lighting sources or excessive decoration. The main function of the stations was speed of transit and practicality. Secondly, the trainsets themselves were all constructed in Romania and did not follow the Eastern European style of construction. Each station usually followed a colour theme (generally white – in Unirii 2, , Victoriei 1, Lujerului; but also light blue – in Obor, Universitate, and Gara de Nord; orange – in Tineretului; green - in Grozăvești), and an open plan. No station was made to look exactly like any other. Despite this, many stations are rather dark, due to the policies of energy economy in the late 1980s, with later modernisations doing little to fix this problem. Bucharest being one of the largest cities in the region, the network is larger than those of Prague or Budapest. When the planned new line-extensions are finished, they will increase the system length to more than 100 km, with about 80 stations. Obor is a metro station in Bucharest, located next to one of the largest open-air markets in Bucharest, Obor. The station was closed for over 10 months, until May 25, 2008, for refurbishment and in order to facilitate the building of a new overground passage for the tram above ground. This station is painted in blue, with pillars separating the two parts of the station. It is currently served by the M1 line. Connections with RATB services are 1, 21, 46 (trams), 330 and 335 (buses). Universitate (University) is a metro station located in University Square, Bucharest, near the University of Bucharest, the University of Architecture, the National Theatre Bucharest and the InterContinental Hotel. The station is one of the deepest in the whole system, with a narrow platform, built around huge pillars designed to sustain the weight of the lobby/subway and square above. Tineretului is a metro station in Bucharest, Romania. It was opened in 1986. The station is named for the Children's park nearby. Generally, the underground stations feature large interiors. The largest one, Piata Unirii, is cathedral-like, with vast interior spaces, hosting retail outlets and fast-food restaurants and has an intricate network of underground corridors and passageways. Public transport in Bucharest is heavily subsidized, and the subsidies will increase, as the City Council wants to reduce traffic jams, pollution and parking problems and promote public transport. [ citation needed ] Like the RATB, the metro can get crowded during morning and evening rush hours. The network uses magnetic stripe cards, that are not valid for use on trams, buses or trolleys . M5 Line: Construction on the first 7.2 km (4.5 mi), ten stations, section, between Drumul Taberei and Eroilor, with a branch to Valea Ialomiței, began in 2011;  a further extension of 11.5 km (7.1 mi) to Pantelimon is approved. In November 2011, Metrorex signed a €97 million contract with CAF for 16 metro trains (96 cars), with options for a further 8 sets (48 cars). The 114m-long six-car trains will be assembled in Romania. They each accommodate up to 1,200 passengers and are made up of four powered and two trailer vehicles. As of November 2014, all trains have been delivered and all 16 of them entered in service. As the CAF trains enter service, all of the Bombardier stock will be moved for use on line M3, according to Metrorex's plans to replace all of the old Astra IVA stock on the entire network. Bucharest Henri Coandă International Airport is Romania's busiest international airport, located in Otopeni, 16.5 km (10.3 mi) north of Bucharest's city centre. It is currently one of two airports serving the capital of Romania. The other is Aurel Vlaicu Airport, which no longer serves scheduled passenger traffic. Bucharest has the largest transport network in Romania, and one of the largest in Europe. 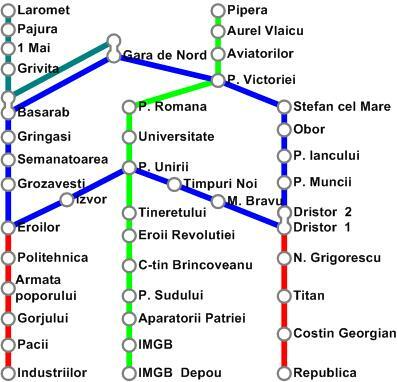 The Bucharest transport network is made up of a metro network and a surface transport network. Although there are multiple connection points, the two systems operate independently of each other, are run by different organisations (the metro is run by Metrorex and the surface transport network by Societatea de Transport București. The two companies used separate ticketing systems until 2017, when a new smartcard was introduced alongside the old tickets, which allows travels on both the STB and the Underground. Crângaşi is a metro station in the Crângași neighborhood, northwestern Bucharest. Pipera is a metro station in Bucharest, located in the Pipera district. Opened in October 1987, it is the northern terminus of Line M2. Piaţa Victoriei is a metro station in Piaţa Victoriei, central Bucharest. It is near the Victoria Palace, the headquarters of the Romanian government. This station consists of two stations and, along with Piaţa Unirii is one of the busiest metro stations in Bucharest. It was the setting for many parts of the documentary Children Underground. Basarab is a metro station in Bucharest. Despite its name, it is not located near the Basarab railway station, but rather to the north-eastern end of Gara de Nord, Bucharest's main railway station, at the intersection of Calea Griviţei and Nicolae Titulescu Avenue. 1 Mai is a metro station in northern Bucharest, serving line M4. It is situated in Chibrit or Clăbucet Square, at the intersection of Griviţa Way, Ion Mihalache Avenue and Bucureştii Noi Road. Piața Unirii is a major metro station in Bucharest. It is located in the southern part of the city centre, in Unirii Square and it is one of the busiest stations of the Bucharest Metro. 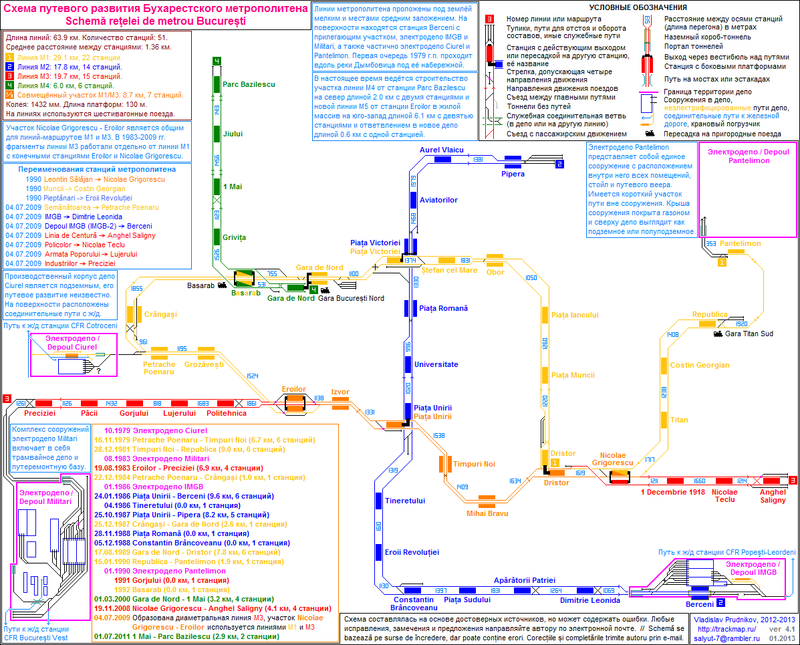 It is made up of two terminals, one on the M1 and M3 lines and another on the M2 line, linked by a passage. Basarab railway station in Bucharest is situated near the city's main station, Gara de Nord. Built in 1959 to handle a share of the main station's traffic and mainly used by short-distance commuter trains run by Căile Ferate Române, it is often considered to be an annex of Gara de Nord, to which it is linked by a footbridge. Gara de Nord is the name of two separate metro stations, situated near Gara de Nord train station in Bucharest and serving lines M1 and M4. Neither of the metro stations nor the railway station are interconnected, passengers being required to use the next station (Basarab) to switch from M1 to M4. M1 is the first line of the Bucharest Metro, the first section having been opened on 16 November 1979. The M1 Line runs from Dristor 2 to Pantelimon. Between Nicolae Grigorescu and Eroilor it shares tracks with the M3. Due to Pantelimon only having one platform, most trains terminate at Republica, and only one in three terminates at Pantelimon. Although part of line M1, some Bucharest city tourist maps show this short section in a different colour from the rest of the line. M2 is one of the four lines of metro of the Bucharest Metro. The M2 Line runs from Pipera to Berceni, thus linking the north from the south of the city. The line is the busiest on the system, passing through a multitude of neighbourhoods and also the only line to serve the centre of the city. M4 is one of the 4 lines of the Bucharest Metro. It is currently the shortest, at 8.3 km (5.2 mi) long and also the newest. It runs from Gara de Nord to Străulești, following the Griviței and Bucureștii Noi avenues. M5 is a metro line of the Bucharest Metro currently under construction. The M5 Line will run from Râul Doamnei, in the Drumul Taberei neighbourhood, to Eroilor, and to Valea Ialomiţei, in the first phase. After that, the line will be extended to Iancului, and from there under Iancului Road until it reaches the Pantelimon station of M1. The expected construction cost is €740 million. M3 is one of the 4 lines of the Bucharest Metro. M3 Line runs from Anghel Saligny to Preciziei. It is the east-west line of the system. M6 is a planned metro line of the Bucharest Metro. The M6 Line will connect Bucharest North railway station to Henri Coandă International Airport. The line is expected to be completed by 2025-2030. The Bucharest light rail is a light rail transit system in Bucharest, Romania. Giurgiului is a neighborhood in the southern part of the Romanian capital Bucharest, near Berceni and Ferentari. Like Berceni, Giurgiului has plenty of 10-storey blocks of flats that were built under Communist rule starting with 1959-1964. The estimated population is between 30,000 and 40,000. Before the Communists started their massive building programme, Giurgiului was a farming village. After 1948 the village was added to the city area. A few years later in the south of the neighborhood a pipe factory was built along with a power plant, CET Berceni. 1 2 3 4 5 6 7 8 9 "Metrorex - Network features". Metrorex . Retrieved 2014-05-07. 1 2 "Metrorex - Map" (in Romanian). Metrorex . Retrieved 2014-05-07. ↑ Călin Cociș (9 September 2015). "Topul stațiilor de metrou din București, după numărul de călători. Stația SURPRIZĂ de pe locul I". B365. 1 2 3 4 "Metrorex - Metrorex history". Metrorex . Retrieved 2014-05-08. 1 2 "30 de ani de exploatare a metroului bucurestean" (in Romanian). agir.ro. August 2009. ↑ "Metroul bucureştean, 10 lucruri pe care ar trebui să le cunoşti" (in Romanian). historia.ro. Retrieved 2014-07-29. ↑ "Bucureştiul mileniului trei imaginat în 1930" (in Romanian). cotidianul.ro. Retrieved 2014-07-29. 1 2 "Ce nu știați despre metroul bucureștean: De la planurile din 1909, la Magistrala 7" (in Romanian). 19 November 2012. Retrieved 2014-07-29. ↑ "Istoric Metroul bucureştean" (in Romanian). metroubucuresti.webs.com. Archived from the original on 9 August 2014. Retrieved 29 July 2014. ↑ "Metrorex - Schedule". Metrorex . Retrieved 2014-05-07. ↑ "Metrorex - Fees". Metrorex . Retrieved 2014-05-07. ↑ "Bucuresti metro expansion tendering". Railway Gazette. 22 February 2011. Retrieved 2011-02-27. ↑ Vlad Ignat. "Păianjenul Metrorex schimbă harta Capitalei. Bucureştenii se mută în subteran, din 2030" [Metrorex's Web Project changes the map of Bucharest. Bucharest moves underground by 2030]. Adevărul (in Romanian). Retrieved 2014-05-07. ↑ "Metroul din Bucureşti, singurul din lume care a funcţionat cu călători în perioada de probe | Bucurestii Vechi si Noi". www.bucurestiivechisinoi.ro (in Romanian). Retrieved 2018-07-07. ↑ Juncu, Diana. "10 lucruri pe care nu le știai despre metroul bucureştean". OBSERVATOR.TV. Retrieved 2018-07-07. Wikimedia Commons has media related to Bucharest Metro .